The typical large city has thousands of swimming pools, which require considerable costs for upkeep. The most tedious aspect of owning a pool isn’t so much the cleaning, but the fact that it is often rarely utilized, and a pool which isn’t used or cleaned can become a breeding ground for mosquitoes. If you have a pool that you rarely use, you should convert it into a koi pond. Below are some reasons why. Once you have the essential infrastructure established, the pond can be installed. Since many swimming pools have no bottom drain, there are methods you can use to resolve this with some fantastic results once the fish are added. You’ll need to decide what type of filtration system you’ll want to use, since the water will need to be filtered. You may also decide to change the pool’s color (many switch it to black). Once this is done, the pool will need to be emptied. This is essential so that the new filtration unit and pipework can be installed. After this you can fill up the pond and then add the koi, along with planters and wetlands. Since you are doing a conversion and the pool wasn’t originally designed for koi, there are a number of things to remember. 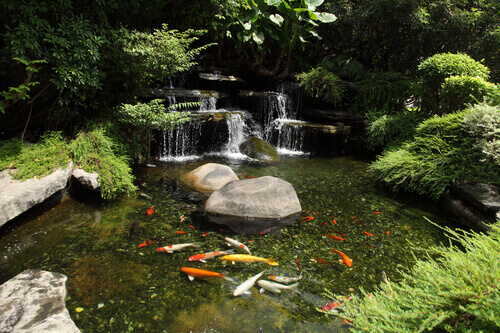 Aside from the quick and relatively easy conversion process, the biggest benefit of switching from a pool to a koi pond is the impact on the environment. Homeowners that are serious about making their properties eco-friendly, who don’t use their pools much, should seriously consider a switch. Swimming pools are criticized by environmental groups due to their high cost of construction, the large amounts of water they waste, and the considerable energy needed to maintain them, which includes the use of chemicals, some of which are harmful to the environment. A koi pond, by contrast, is a biological system that is closed. The fish will feed off the plants, and in turn the plants will feed on the nutrients which the fish supply, along with bird droppings. The algae are responsible for the regulation of oxygen and CO2 levels. If you have mollusks or zooplankton present, they will feed on the algae (while small amounts of algae are good, too much is problem). Because a koi pond contains living organisms, it will require some work to maintain, otherwise it can fall into disrepair and deteriorate worse than a swimming pool, so it isn’t a good option for homeowners who are busy and or who don’t want to spend the money to hire others to maintain it. But for those that do, converting an existing swimming pool into a koi pond is a great idea, especially since it will cost far less than installing a new pond from scratch.